Let everyone know about your art show! The submission period has closed with a record number of entries. Please join us for the exhibition opening and awards reception on 15 March 2019 at 5:30pm. Work selected for the exhibition will be on display in the Museum’s galleries from 15 March through 14 June 2019. THE ARNOT ART MUSEUM is located in Elmira, New York USA. Housed in its original 1833 showcase with a grand late twentieth century gallery addition, the Museum displays its permanent collection of seventeenth to nineteenth century European paintings and nineteenth and twentieth century American art. Temporary exhibitions highlight various aspects of the collections and include works from around the world. The 34th Annual Watercolor Wyoming National Juried Exhibition will showcase the talents of watercolor artists from across the United States. The show will be on display at the Sheridan Public Library in beautiful Sheridan, Wyoming during the month of August, 2019. The artists’ reception and award ceremony will be Tuesday, Aug. 13, 2019. 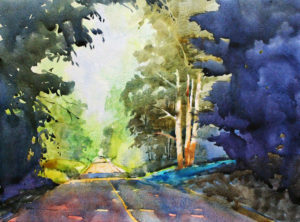 This year the juror and watercolor workshop instructor is well known artist Mark Mehaffey. Cash awards are given for Best of Show, Best Wyoming Artist, 1st Place, 2nd Place, 3rd Place and Honorable Mention. Show entry is open to all artists 18 years of age or older, working in water media on paper and unvarnished. Deadline for entry is May 31, 2019. The week-long workshop will be held in Sheridan Aug. 12– 16, 2019. Membership in the Wyoming Watercolor Society is encouraged, but not required. Discounted fees for the workshop and show fees will apply for members. The prospectus, workshop information and membership form can be found here.